Hi there! 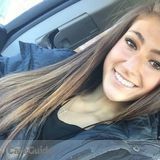 :) I'm Olivia and I am in my junior year as a student-athlete at WMU. I live in an apartment close to campus where I would take care of your pup. I also have a car so I am willing to come to your residence if needed. I have always had a deep love and affection for dogs so I will treat your doggy as if it's my own! I have owned three dogs throughout my life, with the most current being Niko (a Sheltie puppy who lived with my parents in Ohio). I have been around dogs my entire life, so I know how to provide them with the love, care, and attention they need! Available: Pet sitter/walker/playmate in Portage, MI.